Sell your book now, in eBook and paperback! 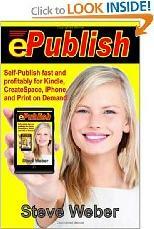 Self-Publish Fast and Profitably for Kindle, iPhone, CreateSpace and Print on Demand. Book marketing guru Steve Weber shares the secrets big publishers don't want you to know. • Profit now by uploading your book to Amazon's Kindle, Apple's iPhone, and other mobile platforms. • Turn your text into a profitable paperback edition with no upfront costs for printing, storage, or shipping. • Get free, global exposure with no marketing costs. • Discover why you don't need a traditional publisher or agent. • Get reviews for your book and maximize sales. • See the fastest, cheapest way to copyright a book in your name. • Get tax breaks and home-office write offs. • Price your content for maximum profits. • Cut out costly middlemen. • Spin off your books into more cash-producing formats. • Expand your income and marketing with podcasting. No longer must new writers "pay their dues" by working for free and getting rejection notes. Now you can upload your sample chapter or short story to Amazon and other platforms and start selling it now. When do you want to start, and how much do you want to pay? You can pay thousands of dollars to a "self-publishing company" that might take months to get your book on the market, and screw everything up in the process. Or you can do it yourself the right way. You can read ePublish by Steve Weber, and get the advice you need to get started now - at the lowest possible cost, with the lowest possible risk, and highest possible chance of success. Reader Lance H. Schmidt of Cincinnati, OH says,"Steve Weber has done it again! This book is just what I was looking for. Mr. Weber's book has the answers I have been seeking, and his experience and talent come through in spades. A must-read for anyone interested in e-book publishing. Well thought-out and imminently readable, ePublish: Self-Publish Fast and Profitably for Kindle, iPhone, CreateSpace and Print on Demand (Kindle Edition)is a great investment for those interested in e-publishing. Download it now and take advantage of the author's unique insight. Well done, as usual!" Reader Victorya Rogers of Dallas, TX says,"Once again book marketing guru Steve Weber gives writers a book on the cutting edge of the publishing industry. His latest book ePublish gives you step by step how-to in the world of self publishing on the web, including Kindle, iPhone and other formats state of the art formats. He also gives you the exact formatting instructions for each platform.